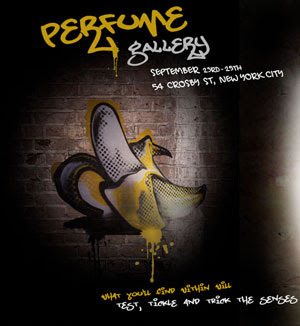 Just back from the press tour of the Lush “Gorilla Perfume” fragrance launch in SoHo. It was unusual in a number of ways. First, multiple scents were introduced in a single event. Second, each was showcased in its own ambient-scented, stage-set room. And finally, while there were placards and hand-scrawled descriptive text placed here and there among the props, each scent was entertainingly narrated and sampled by its own live tour guide. Having returned only last week from a Southern California college tour with the eldest of the FirstNerve spawn, the experience had echoes of earnest undergraduate guides describing the charms of campus, and of the total-surround theatrics of a Disneyland ride. At Lush, one walked through a heavy black curtain to move from one scented scene to the next—very Pirates of the Caribbean. The sociable and entertaining nature of the event was a good fit for the Lush Gorilla Perfume line, where perfumer Mark Constantine and his son Simon weave their personal stories into the stories of the perfumery raw materials. The result is product images with a remarkable depth and texture. While the company emphasizes natural ingredients, the common olfactory theme of the scents is easy accessibility, for example, the prominent dirty jasmine note in Lust. Constantine and son have a novel solution to the dilemma of Ingredient Voice versus Imagery Voice: let’s call it Engaging Entertainment Voice. Adding to the amusement was the chance to meet the charming Lush perfumer-in-training Pia Long, aka FirstNerve commenter Nukapai. She is now the fourth blog-persona to step through the pixels and meet me in real life. Turns out people resemble their avatars. Or vice versa. The gallery event at 54 Crosby Street is open to the public for the next three days. I believe the Sniffapaloozians are heading there tomorrow. Engaging Entertainment Voice seems like the snarky, unpretentious kid sister of creed's less than entertaining snotbag voice. That made the bubbles in my GT reverse up my nasopharynx. Aw, shucks . . . I thought that would have been the Statue of Liberty!